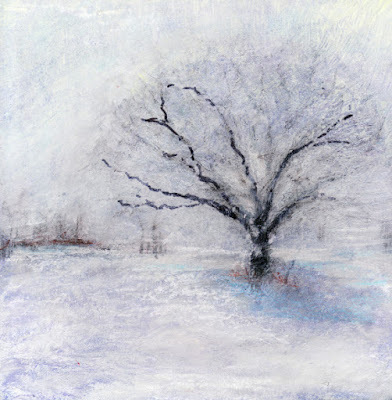 diana lynn's painting a day: Hoarfrost. I heard the term hoarfrost from my mom one winter when I was in grade school. I always wondered how they came up with that name because I thought she was saying, "Whore's Frost." : ) I worked on this piece more than I ever did on any 4th grade math problem. I tried every medium and technique I could think of to make it look like I wanted it to. And still it suffers. I am reminding myself that my initial goal was to "Just Paint."